Is it OK for My Newborn to Strain? 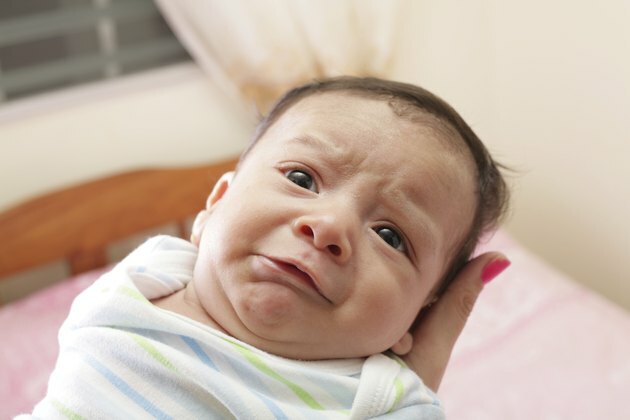 Newborns frequently strain while having bowel movements, particularly in the first few weeks of life. It often takes babies several months to learn how to properly push out bowel movements while relaxing their sphincter muscles, according to Parkside Pediatrics. If a child's bowel movements are soft, parents should not be concerned about straining. Occasionally, however, straining might be a sign of constipation. Normal straining typically lasts only a few minutes or occurs intermittently throughout the day. A child who strains very forcefully for an hour, who appears to be in pain or who has a fever needs medical care. If a child's stools are soft or slightly runny and she has regular bowel movements, parents should not worry about straining. When a child experiences frequent, severe straining, the most common cause is constipation. As pediatrician William Sears explains, breastfed babies frequently go several days without a bowel movement because there is little waste associated with breast milk. If your child is breastfeeding, infrequent bowel movements are not necessarily a sign of constipation. If your baby passes very hard, very dark stools or has not had a bowel movement in several days and is straining, she is likely constipated. Consult your pediatrician, who will help you determine appropriate treatment. Constipation is often caused by minor dehydration, according to pediatric nutritionist Lyn Marotz. When a baby struggles to pass stool, she panics, which makes pooping more difficult and constipation more severe. The single best thing parents can do at home for a constipated child is breastfeed. Breastfeeding provides children with excellent nutrition that decreases the frequency of constipation, according to Sears. Additionally, breastfeeding is soothing to sick babies, who may be more likely to pass stools while nursing. Parents should not give babies enemas or suppositories unless advised to do so by their pediatrician. In most cases, pediatricians advise watchful waiting of constipation, Sears explains. Your child's doctor may also recommend dietary changes or advise giving your child a pediatric electrolyte drink to increase hydration. Some babies require the help of a glycerin suppository, which encourages and softens bowel movements.